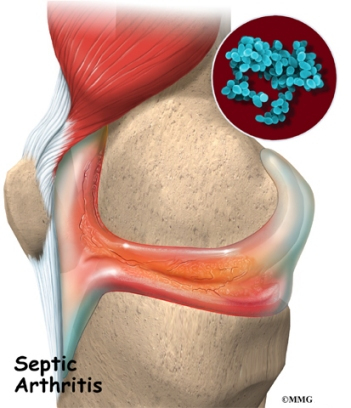 In septic arthritis, the synovial fluid--the lubricating fluid inside a joint--becomes contaminated, or infected, with bacteria. In response to the infection, the body produces white blood cells that try to fight and kill the bacteria. This creates pus that mixes with the synovial fluid inside the joint. The white blood cells that fight infection produce chemicals that may not only kill the bacteria but may also damage the joint surfaces. Once this process begins, the breakdown of the joint can continue even after the infection goes away and the bacteria are all dead. Septic arthritis causes moderate to severe joint pain that comes on from a few hours to a few days. (Doctors refer to this as acute onset.) The pain is much worse when you move or touch the joint. The joint is usually warm and red, and it can't move easily. You may have other evidence of infection, including a fever, chills, flu-like symptoms, and high white blood cell counts. However, 20 percent of patients with septic arthritis run no fever. Even fewer people over 60 run a fever or have high white blood cell counts when they have septic arthritis. Antibiotics alone may not get rid of septic arthritis. The fluid in the joint may need to be drained at least once a day to remove the pus. This can be done using a large needle. In larger joints such as the knee, arthroscopy may also be used to wash the joint out and remove dead or damaged tissue. Surgery may be necessary to drain and clean joints such as the hip and shoulder. Surgery may also be necessary in joints with bone infections and in joints where the infection can't be easily controlled.